Near Monte Vista, CO a few months ago. Nice combination o the wilderness in the mountains and people in that area. Lovely composition with the mountains in the background. Beautiful shot, Will. B&W is perfect for this. Looks like a nice quiet place for some deep thought. Great capture. I love the perspective here and the processing is wonderful! Beautiful landscape shot. I like the BW processing, looks clean and peaceful. I can stare at it for days! gorgeous landscape shot, nicely composed. Beautiful image. 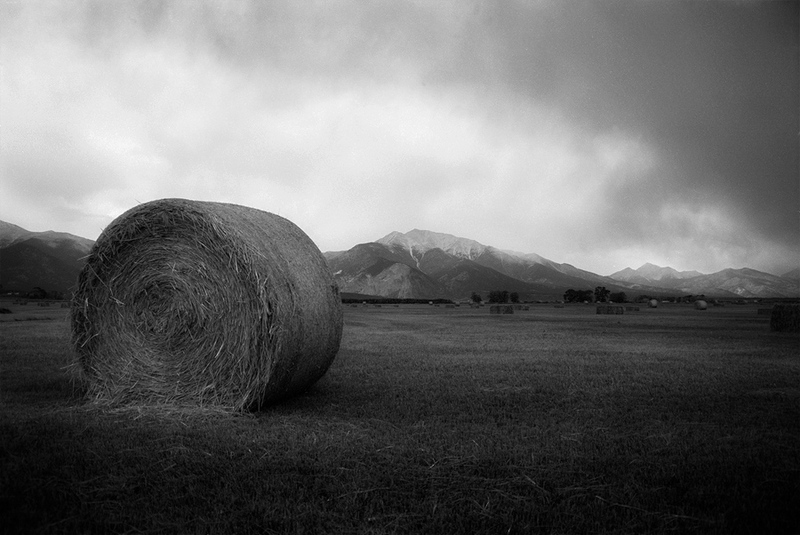 The hay bale reminds me of back home in Nebraska and the treeless mountains remind me of eastern Washington. This is very beautiful. Such a wonderful composition here. Well done. A view that is truly captivating. The mountains and hay bales seem to go on forever. A beautiful picture and perfect perspective. A very nice B&W ! Cheers !